When squabbling splintered the In the Wood closed Facebook group, some members left and formed the Just Regular Collingswood Folks group. In early January, a Facebook group discussion of schools in one South Jersey town veered into a petty attack on one member's grammar, then blew up into a full-fledged kerfuffle – comments deleted, private messages hurled back and forth, and members booted. It was a contentious schism within the "In the Wood" online community in Collingswood, where more than 3,000 members posted about schools, restaurants, the color of tap water and unicorns. But like so many online experiences, near-anonymity shaped the discourse and ultimately led it to splinter. “The World Wide Web is a scary place and there are a lot of a---holes out there,” said Brad Eden, who rides herd over Upland Journal, a bulletin board service (BBS), a precursor of sorts to Facebook’s community pages. Brownfield quit In the Wood, disgusted. Many others did, too, joining another closed Collingswood group – "Just Regular Collingswood Folks." Literally overnight, the Regular Folks Facebook group added hundreds of members, an infusion drawn from one side of the virtual food fight carried out on In the Wood. Membership has grown to more than 1,300. •	Perceived shared interests, such as geographic location or hobbies, bring people together. •	Argumentative and self-segregating human nature tend to splinter groups apart. Indeed, Collingswood serves as a useful social media microcosm that mirrors human nature. Routine dustups – and inevitable breakups – seem to be part of the natural evolution of broad interest Facebook groups, according to Brownfield. But first they arise out of shared interest. For members of In the Wood, that common link is life in their town. 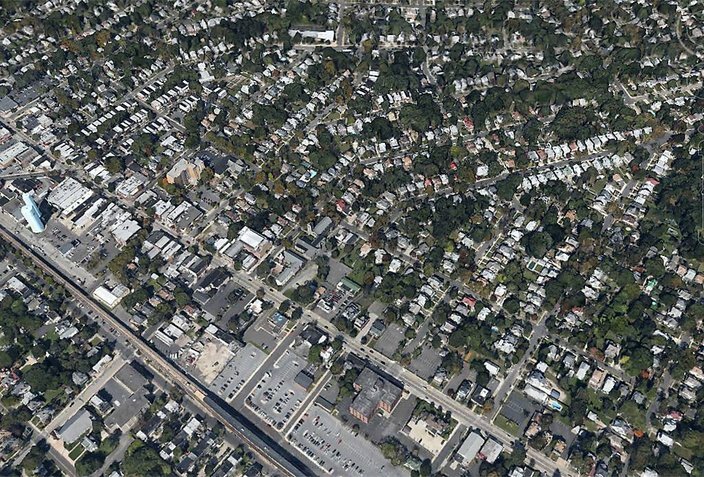 Membership – by approval – is characterized by a strong connection to the tiny Collingswood borough, a less than two-square-mile New Jersey town of fewer than 14,000, just east of Camden. Typical postings on the site are generally about the mundane, including community events, critters (both wild and domestic), youth activities, jobs and work, weather, local government, police activity, unexplained noises and door-to-door solicitors (especially those not from Collingswood). Then there were those particularly inside-the-town topics, such as a fountain installed on the town’s main road and those occasional discussions of unicorns. While In the Wood members said they find a forum to exchange local knowledge useful, there was a strong – some say too strong – tendency to jump on anyone perceived as being negative. As one disgruntled poster wrote in the days after after the blow-up: "There is an expectation that members are to be kumbaya with everything. Never post what could be construed as a negative comment. And never disagree with those who feel they and they alone are in possession of the correct opinion and know what is best for everyone (at taxpayers' expense)." As In the Wood’s first administrator, Brownfield approved new members and eventually added additional administrators. Sometimes she spent more than 20 hours a week moderating, attempting to ensure members played nice together – not always successfully. In the Wood’s fractiousness started, she said, with her decision to allow several “wingnuts” – her word – to join the group. Many of those members, she said, were prone to provocative commentary, often racially charged or vehemently not politically correct. Complicating the matter, Brownfield said the new administrators “started off on the same page,” then took off in different directions. “It was fine at first. And then it all imploded," she said. 'There were two weeks of non-stop private messages. And this was when my father was dying in Delaware and I was driving back and forth. I was trying to be fair to everyone. She now belongs to both groups, but limits herself to mostly just reading and liking some posts – no commenting. Brownfield said the relative anonymity of the interaction on Facebook group pages is part of what fuels the fires in community groups. One man insisted on posting about men of color he insisted on always labeling as "ex-cons knocking on doors in the neighborhood," Brownfield said. "He reported to the group every time he saw black men in the neighborhood." "I wanted to ban racists from the group, but at the same time, most seemed to be clueless about their racism," she said. One individual posted inflammatory comments in search of angry responses, including that Michael Brown – and others shot by police – deserved to be shot. "The arguments that followed included a slew of people declaring 'blue lives matter,' and then responses by people appalled at the attitudes of this individual's followers," Brownfield said. It seems the Internet trolls are “over-compensating,” said Brownfield, and they get a kick out of wielding “power and control” online to make up for their actual lives. “They are sociopaths,” she said, citing a “Psychology Today” piece. Sometimes the administrators are no better, with troll-like issues, she said. “They like being people in authority to compensate” for the rest of their lives, she said. 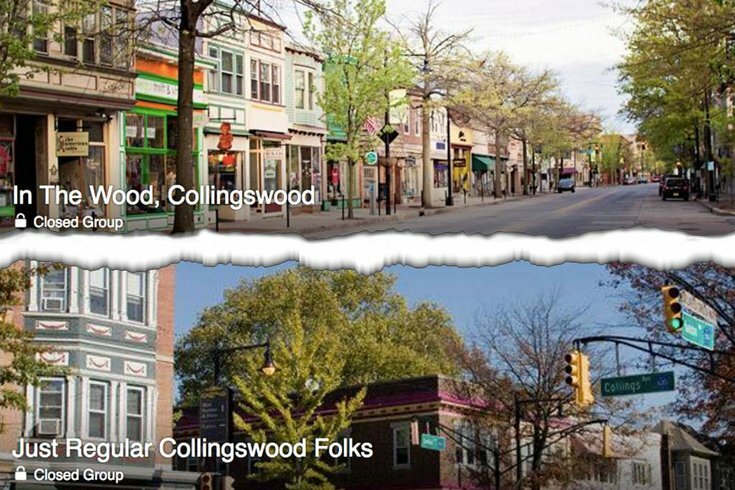 Tiny Collingswood borough, a less than two-square-mile town of fewer than 14,000 in Camden County, has three Facebook community groups. Like expatriates in real life with dual citizenships, many people are members of both Collingswood groups. (There is even a third community group in Collingswood – "In the heart of the Wood" – with fewer than 100 members.) Trying to remain neutral, borough officials simply post information on multiple sites. The rivaling online squabbles are certainly not unique to Collingswood or to Facebook: It’s just a fact of life in online communities, according to Eden, a web veteran of 14 years. "I mostly think I'd be better off not knowing about either of our 'community' pages, which I've mostly stopped paying much attention to in hope of maintaining a good feeling about where we've chosen to live." A commercial artist with an interest in the outdoors and dogs, he created his site following the “carnage” on another outdoor bulletin board. That defunct site was rife with arguments and chest thumping over politics and incessant boasts about which boys owned the best – or at least most expensive – toys. His founding ground rules were no discussions of religion or politics, which generally has kept the peace – though some of his former members split because they wanted to talk politics without a filter. Unlike Facebook, Eden outright owns his bulletin board, so his rules are not subject to debate, but he tries to moderate cautiously. “I’ve eaten 3,000 crows,” he said of his discussions with some unhappy members, adding there is not much need for intervention as a moderator these days compared to his start-up years. While based in Maine, Eden’s site has a fair contingent of members from the Philadelphia area. Just recently, Eden created a companion Upland Journal Facebook group – but with membership extended only by his personal invitation. That has cut down on administrative headaches and minimizes the contentiousness, he said. There is a good and bad to Facebook community groups, members of the Collingswood groups say. "On one hand, you can find out what is going on. But then you also realize your neighbor thinks your dog should poop even before you take it for walk," said one member of a guaranteed hot mess topic. One member explained the appeal of In the Wood: "I really appreciate the community updates, insights and suggestions as to local businesses and school events." But he added, "as far as folks getting angry and weird, it's understandable given that members care about what goes on in their town and can sometimes get carried away." Another member of both groups has largely stepped away from it all following the recent nastiness. "I mostly think I'd be better off not knowing about either of our 'community' pages, which I've mostly stopped paying much attention to in hope of maintaining a good feeling about where we've chosen to live," the person said. Requests for comment made to corporate Facebook officials were not responded to over the course of several days. One administrator of Just Regular Collingswood Folks, a former member of In the Wood who got booted, declined to talk to PhillyVoice for this story; other administrators of that group didn’t respond to requests for comment, either. Jay Levin, an In the Wood administrator who operated a sports bulletin board years before Facebook, knows there is an entertainment quality to following group members who routinely stir things up. “Members tell me it's like watching characters in a reality TV series,” said Levin, who was deeply involved in the January schism as an administrator, deleting comments and barring some members. In a small town like Collingswood, “it presents some challenges, when you get rid of someone who lives down the street,” he added. As a result of the January dustup, he’s curtailed his personal postings, so he’s more clearly enforcing policies, not just reflecting his own personality when he takes action as an administrator. Joseph Russell, a laidback member of In the Wood for the past three years, recently stepped in to become an administrator after the January drama when a former administrator stepped down. Russell witnessed the online squabble, but wasn't a participant. So far, he's taken a light touch to his moderating duties, noting that the group tends toward self-policing. “I believe in letting people hang themselves,” said Russell, punctuating his words with a wry giggle.